Our linen service only uses garments that exceed all relevant safety guidelines and we employ processing methods that result in safe, clean textiles ready to be used in healthcare facilities. We provide hospitals, nursing homes, clinics, and other professional service offices with the linen, medical garments and specialty textile items they require. Our current customers are reaping the benefits of no longer dealing with costly linen investments and inventory problems. Our customized inventory control tools will help you cut waste and reduce costs without sacrificing quality care to your patients. We Are Your Local Textile Services Provider! MEDtegrity is a network of independent commercial laundry companies that provides textile rental (such as scrubs, patient gowns, sheets, surgical towels, etc.) and laundry services to regional and national healthcare customers. While our linen service markets under the MEDtegrity brand name nationally, we maintain independent ownership and a separate corporate name locally. Local healthcare businesses are serviced by our linen service, but as part of the MEDtegrity network. Doctors, dentists, and lab technicians depend on our reliable services. All materials are hygienically clean and meet clinical specifications. Scheduled laboratory checks of our facilities ensure that we always maintain the highest standards. Our freshly pressed garments are functional and attractive. 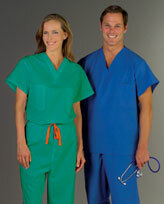 We supply uniforms for all departments and functions ranging from professional looks for surgeons and nurses to comfortable exam gowns for patients. Clean, colorful garments present a positive image to the public, which is more important than ever in modern healthcare settings. Your warm, caring image will go a long way in creating a positive and comfortable environment for your patients. All the garments listed below are available in an efficient and economical rental program. We maintain the highest sanitary standards, above and beyond what is required by OSHA and JACHO. From traditional full-length coats to contemporary consultation garments, our linen service provides the medical community with comfortable styles designed for the healthcare professional. Below are some of the options available through our linen rental program that can help you avoid the rising costs of managing an inventory and laundering in-house. Our linen service offers product options to help your patients feel as comfortable as possible. Below are some of the options available through our linen rental program that can help you avoid the rising costs of managing an inventory and laundering in-house.